The main Hsing Tian Kong is located in the culturally rich surroundings of downtown Taipei City. Amid the hustle and bustle of the city, it exudes a unique air of serenity and propitious harmony. Here the faithful can find complete support and clarity. 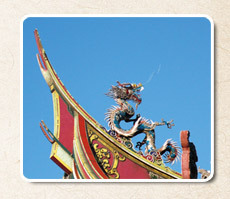 When you come to Hsing Tian Kong, please take the time to savor the detail of its traditional architectural beauty. Standing as guardians on the main ridges of the temple roofs, they signify prayers for rain, warding off evil, and preventing fires. In ancient times, people believed that when the earth was at peace, phoenixes would appear. 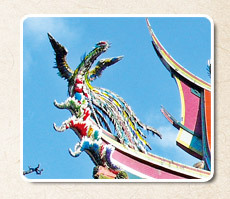 Accordingly, the phoenix has long been an auspicious symbol. 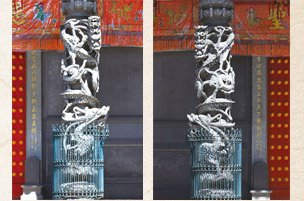 Two dragons are coiled around each column, representing the universe at peace. A coiled dragon is a dragon that has not yet ascended to heaven. In traditional Chinese architecture, the buildings that connect a front hall to a main hall are called "hu long"("guardian dragons"). Left Hu Long: Sermon hall, for preaching the True Faith. Right Hu Long: Information desk. 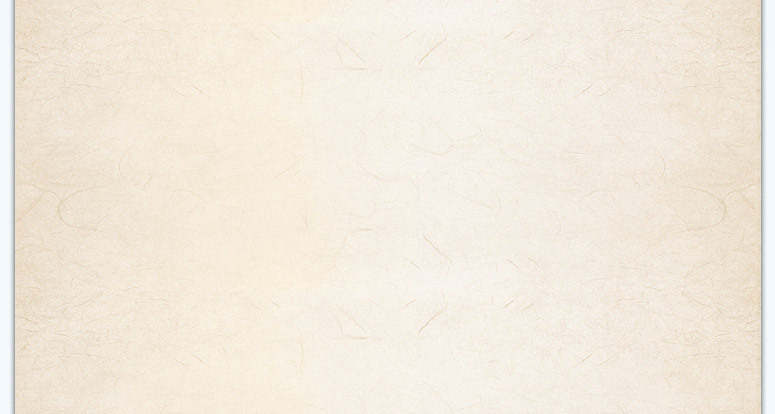 Here you can collect oracular poems and ping'an cards. When you come to Hsing Tian Kong, before entering the inner courtyard, you can freshen up and adjust your clothing and headwear in the hand washing area. You can wash fruit and other items to be presented as offerings in the fruit washing area. Dishes are available for fruit offerings. Between the fruit washing area and the hand washing area is a mirror with the words "wen xin"—"ask your heart." This is to encourage believers to often examine their own consciences and to behave uprightly. "A red heart: good fortune, rank, longevity; a black heart: poverty, disease, hardship." The deities bless people who have a red heart (who act with benevolence and do good deeds), and punish those who have a black heart (who act with evil and do immoral deeds). 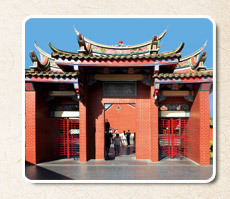 The routes in and out of the main Hsing Tian Kong are the Xun Gate (Wind Gate) on the left of the temple (looking from the outside) and the Kun Gate (Earth Gate) on the right. 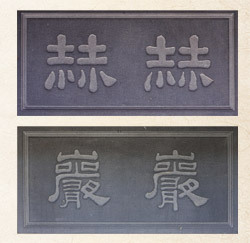 "Hehe"—meaning "bright" or "magnificent"—inscribed over the Xun Gate, encourages the faithful to practice virtue and respect the deities, and never to secretly harbor unconscionable thoughts. 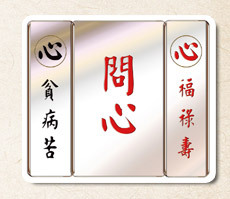 "Yanyan"—"towering and majestic"—inscribed over the Kun Gate, exhorts the faithful to act in accordance with the True Faith, and not to seek the deities' assistance for selfish aims.